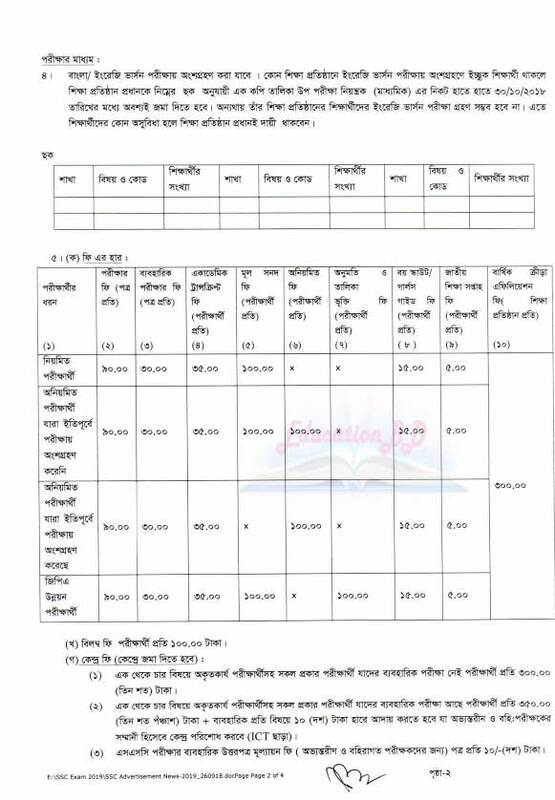 SSC Routine 2019 published for all education board Bangladesh. Students can download full SSC exam routine 2019 from our website as well as official education board in Bangladesh. If you are looking for a routine for your board, then you are coming to the right place. SSC Form fill up has already finished for all education board in Bangladesh. So the exam knocking every SSC candidate. The month of February is the possible date for the SSC examination. The Dakhil Exam will also start the same day of SSC Examination. Some changes in the Dakhil routine are from the SSC routine. The main SSC routine will publish from the central education board Dhaka. That routine is the same for all boards. 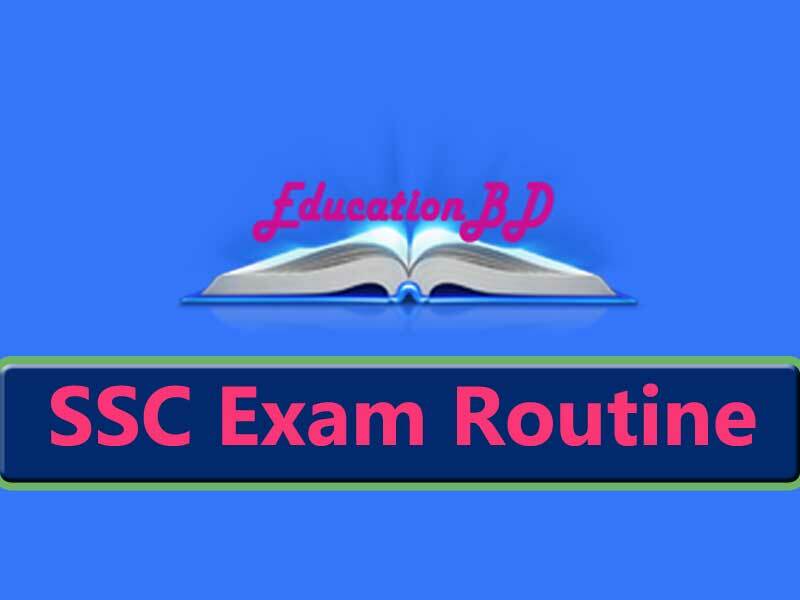 SSC Routine 2019 will available on our website EducationBD. You can download your desired board routine as PDF, Image or Word format from our site. You won’t go anywhere to get your SSC routine. There is a possibility of starting SSC exams from February 2 and will run for one month. Keep in touch to our website to get the latest update about SSC examination 2019. The Students who completed 10th Class under Secondary education board Bangladesh can participate in SSC exam 2019. The number of SSC examinations are increasing every year. Last year, the number of SSC Candidates was 13,15,002. Every year, most students from the Dhaka Board participate in SSC exams. The number of examinations of the Ananya Board is much lower than the Dhaka Board because the Dhaka Board is vast. When SSC Routine 2019 will Publish? After completing the SSC form fill up, only one question has students mind that when will the routine be published. Nobody can say anything better about when the SSC routine will publish. Regularly monitor our site and publish it here as soon as the routine realize. Every year the SSC exam starts in February. In 2019 SSC exam also begin from February. Routine usually published 1 to 1.5 months before the start of the exam. When SSC Exam 2019 will start? SSC exams will begin on February 2 or February 3. All the Board will start testing simultaneously. The test period will be 3 hours. In this 3 hours, you will have to answer all the questions. There are ten board boards, including Madrasah and Technical Board in Bangladesh. There is a possibility that all the board questions will be different. If the questions of all the boards are the same, then the probability of being leak out of that question is very much. Because in the past many times Bangladesh has been questioned leaked of various exams. All of us who are examinee, we are searching the pdf file for our exam. The PDF routine is very different and bright. We’re sharing this complete PDF file here. You can check your routine full by using pdf documents. As the routine of all the boards is the same, that’s why you can see all the board routines from here. Direct download We gave above. Just click the download link and Save your routine. If you have any problem downloading, then comments here. Save your desired routine as a picture. Usually, after 2-1 days of the end of the test, practical experiments begin. In 2019 practical exams will start from 2 days after the SSC examination, which will continue till 5th March. In the meantime, practical experiments have to be completed. The routine gives below. There are ten educational boards in Bangladesh under all education board Bangladesh including Madrasha and Technical Education Board. Dhaka board is one of the biggest and popular boards in Bangladesh. It is the central education board in Bangladesh. It controls all education board. This board publishes the routine on their official website or education board websites. Location: Joynag road in Bakshibazar area, Dhaka. With the publication of the SSC routine, you will get the routine of Dhaka Board website. Rajshahi board is the 2nd highest education board in Bangladesh. Examine of Rajshahi Board can check their Routine using education board website or Rajshahi education board official website. 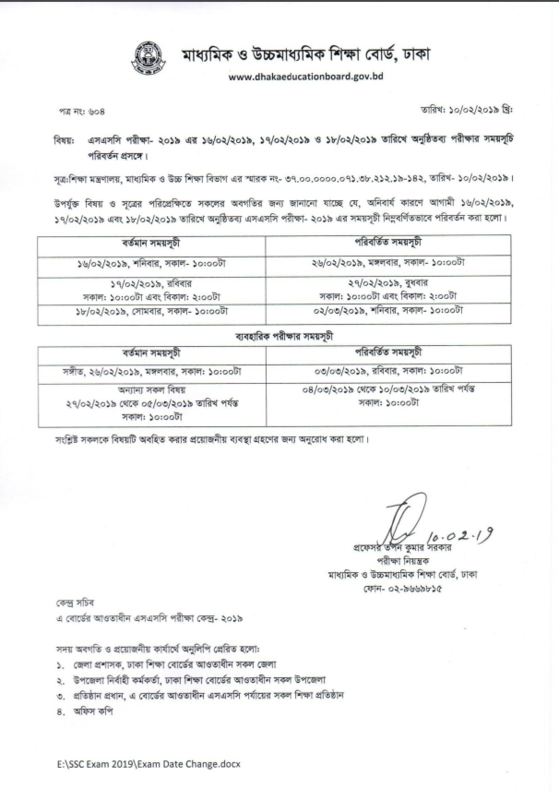 Routine of SSC in Rajshahi board will publish same day according to others education boards. 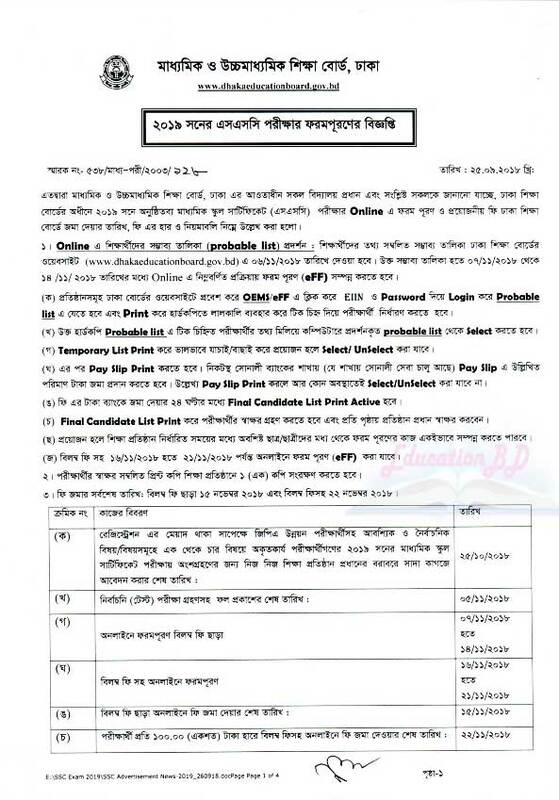 After Publishing SSC Routine 2019, You will get Rajshahi board official site or Dhaka board website. Chittagong board is also a famous education board in Bangladesh. Every year many students participate SSC Exam from Chittagong board. In 2019, A considerable number of students will participate SSC examination 2019. 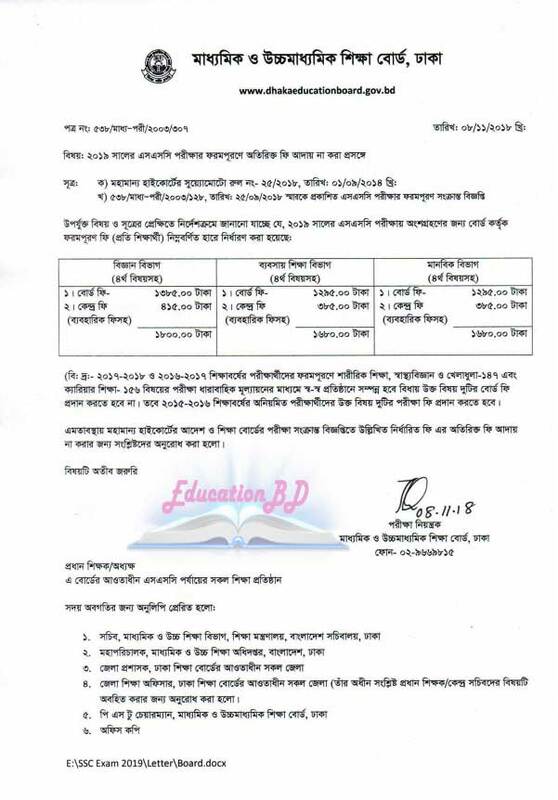 Examinee of Chittagong board can check their routine through official website or education board sites. After Publishing SSC Routine 2019, You will get Chittagong board official site or Dhaka board website. Comilla board is a beautiful board in Bangladesh. You can check your Routine by using Comilla board official website. A considerable number of students will participate SSC examination 2019 from Comilla board. Every year students of Comilla board get the right amount of GPA-5 and pass rate too good for this board. Jessore board is another finest education board in Bangladesh. The Jessore board contains intermediate and secondary education. A massive number of students will attend the SSC exam in 2019. Check Your Routine Easily through Jessore board official website or Education board website. Sylhet board is another finest education board in Bangladesh. The Sylhet board contains intermediate and secondary education. A massive number of students will attend the SSC exam in 2019. Check Your Routine Easily through Sylhet board official website or Education board website. Barisal board is education board in Bangladesh. 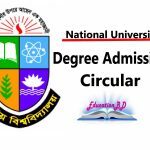 The Barisal board contains intermediate and secondary education. A massive number of students will attend the SSC exam in 2019. Check Your Routine Easily through Barisal board official website or Education board website. 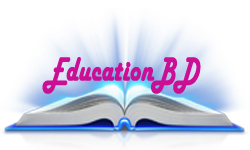 Dinajpur board is an education board in Bangladesh. The Dinajpur board contains intermediate and secondary education. A massive number of students will attend the SSC exam in 2019 from Dinajpur board.. Check Your Routine Easily through Dinajpur board official website or Education board website. It has been finished the SSC form fill up a few days ago. Only those students who are passing the test exams can be able to read the SSC form and can apply at SSC Exam in 2019. This time, there is a rule that any educational institution will not be able to recover the extra fee from the child. This photo offers forum fee-related information. Results are published within 60 days of the end of the test. The SSC/Equivalent result 2019 like Madrasha board and Vocational or technical Board result will publish same day as like SSC result 2018. The SSC or Equivalent exam will start this year on 2nd February and Ended 25 February 2018. If you have any problem and question then comment here, We will contact you ASAP.